Rocky Ros Muc, an award winning Irish Language Broadcast Fund feature documentary produced by Below The Radar, will be released in cinemas in America. The documentary, telling the story of Galway boxer, Sean Mannion, will be shown in cinemas in New York, Los Angeles and Boston. Earlier this year Rocky Ros Muc won Best Irish Feature Documentary at the Galway Film Fleadh and Best Documentary at the Irish Film Festival, Boston. 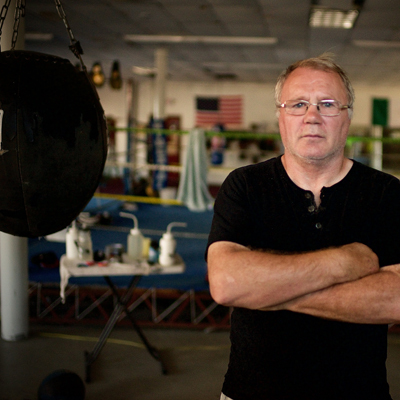 The documentary tells the gripping story of boxer Sean Mannion and the story of the Irish in Boston. From humble beginnings, to challenging the world title crown. From the quiet Gaeltacht village of Ros Muc in County Galway, to the criminal underworld of James ‘Whitey’ Bulger and the mean streets of Boston. Rocky Ros Muc examines spirit inside the ring and troubles outside; the reality of emigration and its impact on identity. The film will premiere in both New York and Los Angeles on Friday October 6th and in Boston on Friday October 13th. It will screen at Cinema Village, New York and at Laemmle Music Hall Theatre, Beverly Hills. In Boston the film will screen at the Regal Fenway 13 cinema. LA based distributor Double Exposure is co-ordinating the release. Rocky Ros Muc is a Below The Radar production made with support from Northern Ireland Screen’s Irish Language Broadcast Fund, TG4, Bord Scannán na hÉireann/the Irish Film Board, the Broadcasting Authority of Ireland and MG Alba. The film was produced by Máire Bhreathnach and Executive Produced by Trevor Birney. Rónán Mac Con Iomaire was Associate Producer on the film with Mairéad Ní Thréinir as Assistant Producer. The film was edited by Michael Paisley with an original score composed by Andrew Simon McAllister. Tá an scannán faisnéise Rocky Ros Muc a léirigh an comhlacht Below the Radar, le taispeáint i bpictiúrlanna i Meiriceá. Beidh an scannán faoin dornálaí Gaillmheach, Seán Ó Mainnín, á thaispeáint i bpictiúrlanna i Nua-Eabhrac, Los Angeles agus Bostún. Thug an scannán gradam na féile leis ag Féile na Scannán Éireannach, Bostún ní ba luaithe i mbliana gur bhuaigh an gradam don Scannán Faisnéise Éireannach is fearr ag Fleadh Scannán na Gaillimhe chomh maith. Déanann an scannán cur síos ar shaol agus ar ghaiscí dornálaíochta an Mhainnínigh mar aon le scéal na nGael i mBostún. Ón saol simplí a chaith sé, is amhlaidh a bhí sé san iomaíocht do chraobh dhomhanda na dornálaíochta. Ón phobal shocair chiúin Gaeltachta i gcontae na Gaillimhe go domhan na coiriúlachta de chuid James ‘Whitey’ Bulger agus sráideanna neamhthrócaireacha Bhostún. Déanann Rocky Ros Muc plé ar an sprid a bhíonn ann laistigh den fháinne dornálaíochta mar aon leis an chorraíl a bhíonn ann lasmuigh de; pléitear scéal na himirce agus an tionchar atá aici sin ar an fhéiniúlacht. Beidh premiere i Nua-Eabhrac agus i Los Angeles araon ar an Aoine 6 Deireadh Fómhair agus i mBostún ar an Aoine 13 Deireadh Fómhair. Beidh sé á thaispeáint sa Cinema Village i Nua-Eabhrac agus sa Laemmle Music Hall Theatre, Beverley Hills. Is i bpictiúrlann an Regal Fenway 13 a bheidh an scannán á thaispeáint i mBostún. Is iad na dáileoirí Double Exposure in LA a bheidh ag comhordú na heisiúna. Is scannán faisnéise é Rocky Ros Muc atá léirithe ag Below The Radar agus a fuair tacaíocht ó Chiste Craoltóireachta Gaeilge Scáileán Thuaisceart Éireann, TG4, Bord Scannán na hÉireann, Údarás Craolacháin na hÉireann agus MG Alba. Is í Máire Bhreathnach Léiritheoir an scannáin agus is é Trevor Birney an Léiritheoir Feidhmiúcháin. Is é Rónán Mac Con Iomaire Léiritheoir Comhlach an scannáin agus bhí Mairéad Ní Thréinir ina Léiritheoir Cúnta. Bhí an scannán curtha in eagar ag Michael Paisley agus is é Andrew Simon McAllister a chum ceol nuachumtha an scannáin.